Can love soften a vengeful heart? “Sticks? You want me to give the man I want to convince to marry me a ball of sticks?” She held her hand back to throw it at him. The leading lady’s heart is as cold as a Minnesota winter in FOR RICHER OR POORER, book two in Kari Trumbo’s “Western Vows” historical romance series. Scarlett O’Hara-esque Elizabeth Whitte has traveled from her ranch in Kansas for one reason—to marry the man whose “bride wanted” ad she had answered, and take him back home to claim her father’s ranch. It seems her father has declared that the first of his daughters to marry and produce a male heir will become owner of the ranch. It’s 1900 and, times being what they are, Elizabeth can’t make the trip unescorted. That’s where Robert, a Canadian Mountie who’s as kind as he is handsome, enters the scene. He has seen Elizabeth safely to the small Minnesota town where she is to meet her intended—a man whose name she doesn’t even know—before returning to his own home across the river in Fort Frances. But nothing goes as Elizabeth had planned. 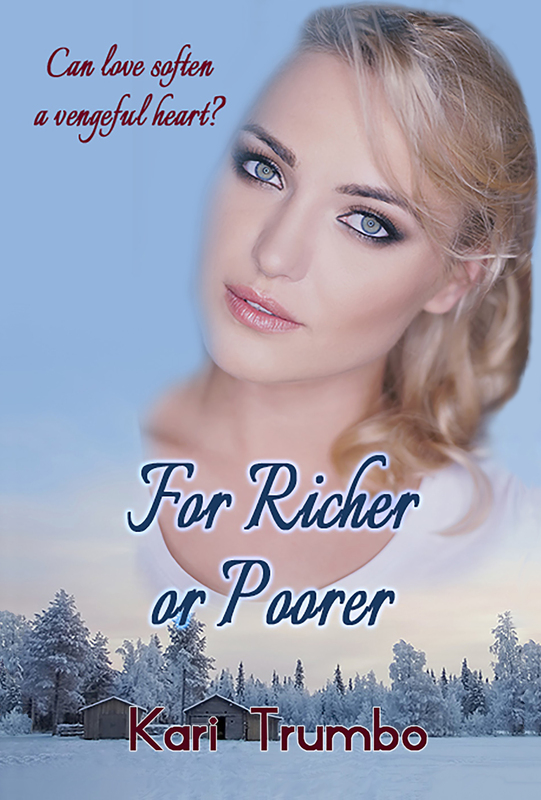 She winds up in need of a job and a place to stay and, well, who better to come to your rescue in the frigid northern wilderness than a Mountie? Curious about what else Lesley has to say? Find the rest of her review on her blog! Don’t forget about the Rafflecopter giveaway, it ends on Sunday! It’s in the sidebar of the blog. That was enough to get any woman riled -the kissing another woman. I love it when an unexpected man -saves the day. Great story line, Kari.